As the name suggests the dish comes from Burma, although its origin has a deep connection with Southern China. In Burma, it got influenced with local ingredient and taste. Here is the recipe. Heat oil in a wok and add all the ingredients for spice paste. Saute it and blend it into a paste when it cools down. To make Khow Suey, Heat oil in a wok, pour in the spice paste, also add salt, pepper and sugar. Then add coconut milk, all the vegetables and tofu or bean curd. Keep on simmer till everything gets cooked and still remains slightly crispy. Add a little water only if required. Add lemon juice and pour over boiled rice noodles and serve with toppings. You may add boiled egg if required. 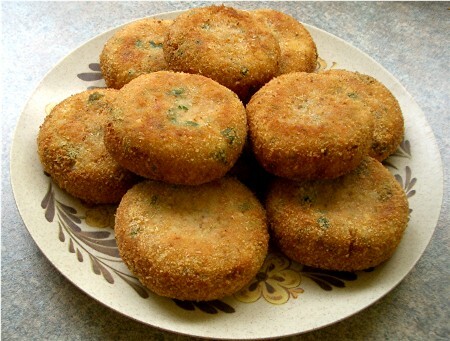 Baked Vegetable Patties are not just quick to make but also very healthy and delicious. The dish is liked by both kids and adults as a side snack or sometimes even as a starter. In a hot pan, add 1 tbsp olive oil and when it turns hot add garlic and ginger. After they turn slightly brown, add green peas, capsicum and carrot, followed by potato and cottage cheese. Now add all the spices and salt. Add green chilli and ½ cup bread crumbs and sauté for about 2 minutes till everything gets along well. Let the mixture cool and then make small balls and flatten them lightly with hands. Put the patties on the bed of remaining bread crumbs, brush them with olive oil and set to bake in a baking dish at 170 degree C for 12 minutes or till they start looking brown and crisp. Wraps are famous in most parts of the world in several flavors. In India, red beans or kidney beans along with spinach leaves in a wrap or roll is a favorite snack for school going kids. In a non stick pan, pour sunflower oil. When the oil heats up, add onions, garlic, ginger and sauté for about 8 minutes on low heat. Add tomatoes. Now add salt, red chilli powder and turmeric powder and let it simmer for another 6 minutes on low heat till oil separates and tomatoes turn tender. Add kidney beans and mix. Cook it covered for 3 minutes till all flavors release and mix well with beans. Now add spinach leaves and cook for another 3 minutes. Keeping the Indian flat bread on a plain surface, line it with a lettuce leaf and pour in some mixture. Lettuce leaf will not let the bread get tender and will keep the crust crisp. Now roll/wrap and keep aside. Make 4 such wraps and then keep these wraps on a warm skillet to turn a little crisp. You may add finely chopped vegetables like bell peppers/capsicum, carrots and peas for making the recipe more nutritious and flavorful. You may also add tomato sauce or chilli sauce for enhanced taste. 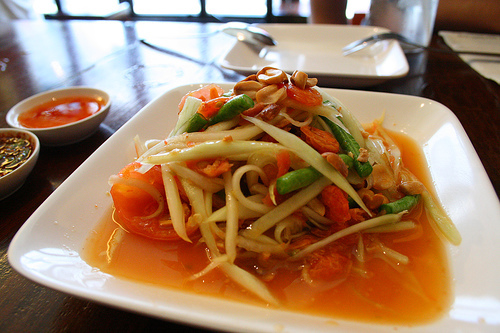 Som Tam or Som Tum is a green papaya salad recipe that was first made in Laos, Thailand. The name refers to ‘sour pounded’ and the recipe is sour and usually spicy. 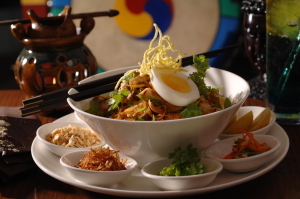 It is eaten with sticky rice or rice noodles. Soak shredded papaya in cold water for 5 minutes. In the mean time, pound garlic and chillies in a mortar and then add jaggery and salt and pound some more till everything comes together as a dressing. Add tamarind juice to this and keep aside. In another bowl, put chopped tomatoes, lime juice and papaya, add pounded dressing and mix for about 10-12 times to evenly coat shredded papaya. Finally, add roasted and ground peanuts and serve. Add some papaya while pounding the dressing to get a mixture of great consistency. You may add some finely julienne veggies like carrots, cucumber, red and yellow capsicum and cabbage for a twist in taste. The recipe is a strict no for pregnant women.